I love the old jokes about people coming home from holidays and showing their photos while everyone sits around with glassy looks on their faces. I don't want to be that person inflicting boredom, but I'm launching into a little travel-inspired series, showing you some wonderful Paris/France pics. So let's get this tour started. You can leave any time you want, ha ha! But I hope you'll at least see a few pics you like or read something that will encourage you to leave a comment. When you visit someplace marvellous for the first time, you're a tourist. Your visit is usually a frenzy of checking out the famous landmarks, monuments, museums, art galleries...it has to be done. Who could visit London and not see Big Ben, Buckingham Palace, Westminster Abbey? Who could visit Berlin and not see the Brandenburg Gate? Who could visit Paris and not see, er, let me see, the Arc de Triomphe, the Eiffel Tower, the Champs Elysee, the Seine, Sacre Coeur, Versailles, the Louvre, Notre Dame, St Chapelle, the bridges, the famous cafes..
Sure, we have to see these marvels when we travel. But the beauty of visiting someplace marvellous for the second, third or even the fourth time, is that we don't have to do these things; we're free to explore and find the beating heart of a place. This is how I felt when I visited Paris yet again. It wasn't about the monuments, although we revisited our favourite haunts, but this time it was more about getting into the heart of things and this included the bygone era of the literary Paris when it was the mecca for struggling artists, writers and actors. We (husband and I) made our headquarters in this gorgeous little rustic hotel, Les Degres de Notre Dame. This hotel was perfect for our stay. Notre Dame was just across the bridge. We were given the 'Romantic Room' so that was sweet. Large by Parisian standards, with even a sitting room, this room was a great base for our stay. 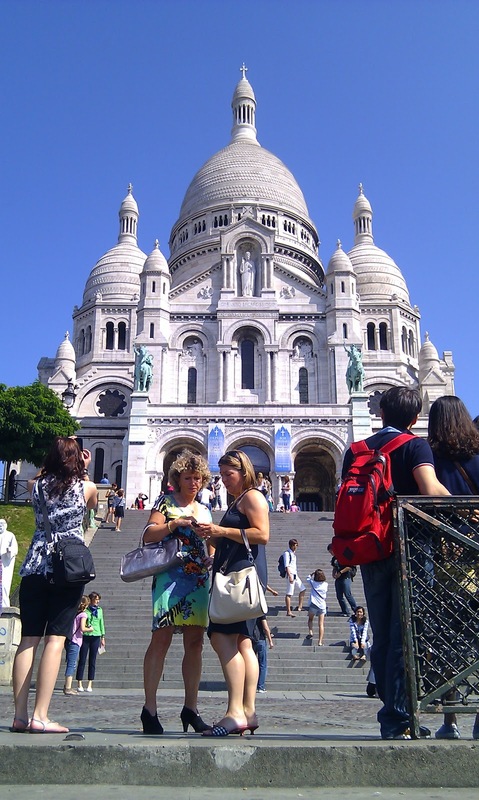 It is on the Left Bank in the Latin Quarter, across from Notre Dame and a stone's throw from Shakespeare and Company. Well, wasn't this a good start for a more literary focus? Shakespeare and Company, just a few streets away! Doing very nicely thanks they tell me! I trotted off to Shakespeare and Company to buy A Moveable Feast (they have a whole shelf of Hemingway's books. And of the other Lost Generation writers like Scott Fitzgerald and co.) After a day packed with adventure and a dinner in 'cheap street' in the Latin Quarter (3 courses for 10 - 15 euro, good sturdy peasant food like mussels, Bouef Bourguignon, creme brulee (gotta have my creme brulee!)) I'd retire with A Moveable Feast. It somehow took on more of a gloss reading it a short walk from where Hemingway lived most of his early, hungry days in Paris in his twenties and Paris' twenties. Well, what would you choose? This one? Or this one? Hmm, decisions...or should we just find a Maccas, more in Hemingway's price range? I love most of Hemingway's work and I greatly admire his work ethic - writing from 5am - midday every day nearly without fail, always on the search for the 'one true sentence.' As Roland posted recently, Hemingway said, 'you write to rewrite.' He drew heavily from his life experiences and these were enhanced with large brush strokes in his novels, some recreated into film with a lot of input from Papa himself. 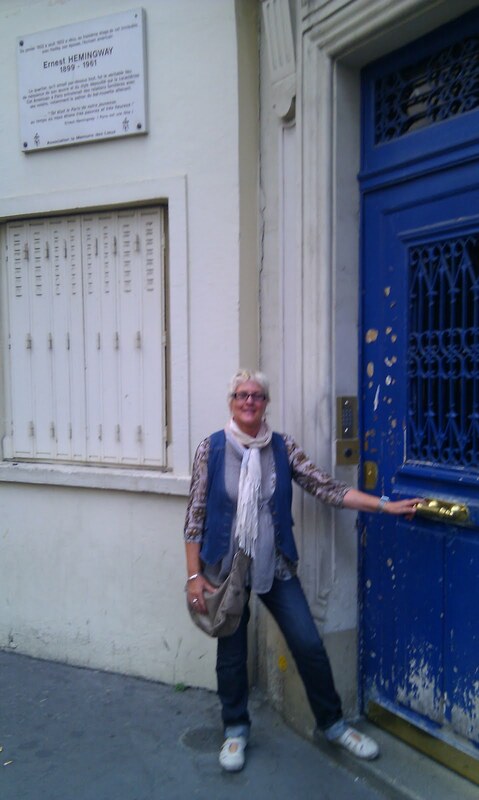 On a previous visit, I followed in the footsteps of some of my Parisian-based idols like Collette and Victor Hugo, and I did start walking up Hemingway's street, but just wasn't in the mood. This time I was. 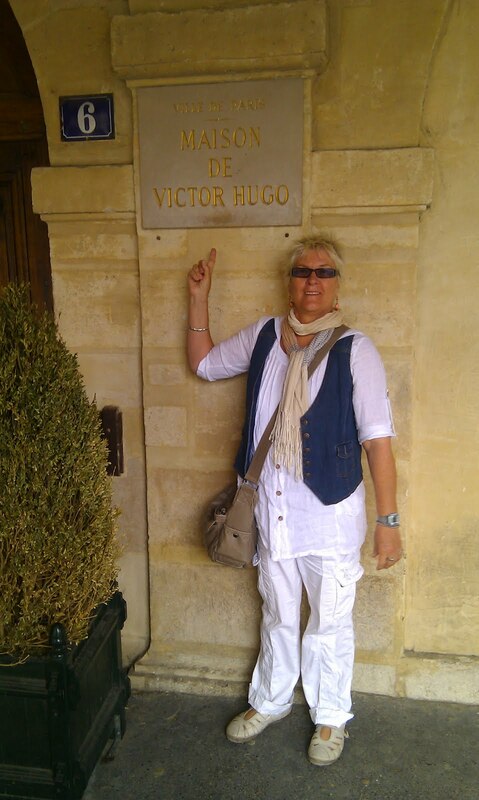 I checked out Victor Hugo's apartments again at the Place des Vosges. Still kept as a shrine to him. 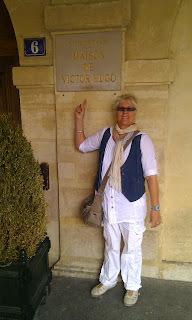 Then had coffee in the cafe Victor Hugo in the passages below his apartment. 74 rue Cardinal Lemoine took on a mesmerising glow during my reading of Hemingway's novel. I wanted to see the apartment building he talks about so much. Where he shivered along with his wife Hedley as they were too poor for heating other than a few sticks. They had no private bathroom. No wonder Hemingway went to cafes to write! He was just too cold at home! So what were his writing habits? At this stage of his life he relied heavily on input from great writers like Gertrude Stein, Scott Fitzgerald and Ezra Pound, all living in Paris at the same time. After his morning spent writing, he'd meet up either casually or planned with one of the 'greats.' Remember he was in his twenties and hadn't yet written a novel. Of course he didn't always take the advice on his writing these luminaries offered; he was very sure about his own talents. A waiter snapped us drinking rhum babas at the Cafe de Flore in 2004, one of Hemingway's favourite writing places. So one afternoon, we stepped out of our hotel, headed to the quai, nodded to Notre Dame, and turned right. We walked past the booksellers and artists until we were opposite the Isle St Louis, then turned right into rue Cardinal Lemoine. It is quite a long street by Parisian suburban standards, but it was fun meandering our way upwards away from the Seine. Hemingway describes it as a 'steep street', which it is anything but. Not many steep streets in Paris except around Montmarte. I guess it felt steep when dressed in your overcoat, feeling full of whisky and rum and shivering with cold. Anyway, to the left we passed James Joyce's Paris home, quite an enclave and much grander than Hemingway's (Joyce had Ulysses under his belt), but we soldiered on right to the top, to the last number in rue Cardinal Lemoine, no 74. He said he lived on the third floor so we had a conversation wondering which was actually his apartment and who lived in it now. Sadly there was no one to ask (turns out they were all having dinner in Place Contrascarpe just down from Hemingway's apartment.) Fittingly there is now a bookshop underneath. Hemingway would have liked that. He says in A Moveable Feast that he loved that apartment, he loved the view and its proximity to everything he needed - his friends, his cafes, his beloved Seine where he would people watch and imagine his stories. He always left his writing when he knew what would happen next so his subconscious could work on it. We should all be so lucky to live in an apartment like he did while writing in Paris. The full article can be found on my writing blog, L'Aussie Writing. Hope everyone is well. I'll be around to catch up when I can! What have you been doing this past month while I've been jaunting around the world? My last visit was a couple of years ago when my husband had a week of business meetings. 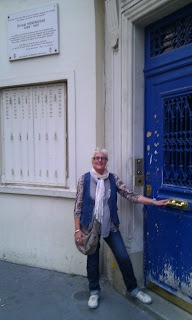 I was a 'free agent' in the day, and had a wonderful time exploring and revisiting places we'd been to over the years. You get a different perspective alone, with no one else to consider. I would stop and read my book for a few minutes at a pavement cafe ot park bench, then wander on to the next place. Glad you had what seems to be a great holiday, and I look forward to reading more about it! Hi Diane. Sorry I didn't get to meet up but we hired our car, left Madrid, then we had trouble with it which mucked up our progress when we were heading from San Sebastian to Sarlat. Had a great time in Sarlat but that's another post. For a country girl, I love to visit cities when I travel. I mostly live in the city at the moment, but Brisbane is more like a big country town. Paris is and I'm sure always will be my favourite. Just so darned pretty!! GaynorB: I sort of have the best of both worlds in that I have a husband who lets me do what I like in my favourite places. So together we sit down in pavement cafes and go on long walks. Super. What better place to stroll than in Paris? Well, in my opinion anyway. I was last in Paris for longer than a few hours about 4 years ago, just overnight. I got to the Mailhol museum, an exhibition at the Louvre, and Angelina's rue Rivoli for a yummy hot chocolate. Sarah: Sounds like you made the most of your quick visit. You'd need a lifetime to visit most of the Louvre! I'll have to make a note of that hotel, looks cute. Thank you for visiting my blog :-) lovely to see people come back. I love everything about Paris and now that I have some fabulous friends there it is even more special. Lovely post. Have you read A Paris Wife? It is a newer release that is about EH's first wife, Hadley and mirrors A Moveable Feast - you might enjoy it.